(KATONAH, NY) What do you think of when you read the word “puppet”? 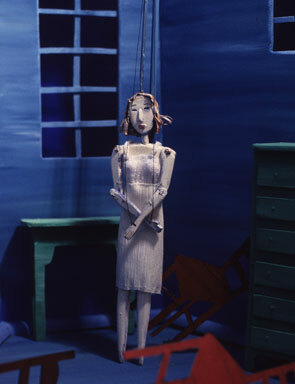 The Katonah Museum of Art (www.katonahmuseum.org) will challenge your thoughts and preconceptions with the presentation of The Art of Contemporary Puppet Theater opening February 28 and running in all three galleries through June 13, 2010. In every culture man has created stories and myths to explain the forces surrounding him and the fears, hopes and dreams he carries within. For centuries, masks and puppets have been used to add magic to the storyteller’s art. The Art of Contemporary Puppet Theater will show that puppets are indeed more than children’s dolls, that within them can be found the illusion of life. They are symbolic mirrors in which we are startled and sometimes delighted to see ourselves reflected. The art of puppetry has been traced back as early as the 5th Century, BC, when figures operated by strings were employed in ancient Egyptian ceremonies. In more recent times it was relegated to childish entertainment, before reemerging as a sophisticated means of expression. Today, puppetry is the perfect union of theater and the visual arts, fusing painting, sculpture, text, music, movement, and technology. The Art of Contemporary Puppet Theater will feature works by puppeteers, sculptors, and film and media artists, which demonstrate how the often daring art of puppetry can explore a range of ideas and emotions. On display will be works by many of today’s most important artists including, Eric Bass/Sandglass Theater, Janie Geiser, Liz Goldberg, Chris Green, Dan Hurlin, William Kentridge/Handspring Puppets (who will enjoy a major exhibition of his work at MOMA this Spring), Ralph Lee, Mabou Mines, Brian Selznick, Julie Taymor, Hanne Tierney, and Basil Twist. The exhibition will also include films by Genevieve Anderson, Laura Heit and the collaborative team of Tony Giordano, Jason Murphy and Scott Shoemaker. The Art of Contemporary Puppet Theater is curated by Leslee Asch, Executive Director of the National Dance Institute. Before coming to the Institute, she spent twenty years at Jim Henson Productions (the creator of the Muppets) where she was the Executive Director of the Jim Henson Foundation; Producing Director of all 5 Henson International Festivals of Puppet Theater; Director of Exhibitions; and a Puppet Builder/Designer.